Learn 5 more proven marathon mental strategies. This will help you hang in there when the going gets tough. It’s vital to keep practicing these mental hacks so download the Mindset Checklist where all 10 are packed on to one page for easy reference! In last week’s episode we covered five ways you can overcome negative thinking and boost your marathon motivation. So, let’s crack on and challenge some more limiting beliefs. The sixth thinking trap is sifting through experiences to pick out negative aspects. But at least I get the opportunity to share another marathon training example! If you’ve worked directly with me or accessed any of my online trainings, you’ll know I’m a strong advocate of repeat-based workouts to supplement continuous runs. However, it’s critical they’re done correctly or they can stall or delay your progress. A common mistake marathon runners make with repeats is micro-managing them mentally. It’s the unnecessary scrutiny of each individual repeat. Despite successfully staying within the target pace zone throughout the session. The key to a good repeats workout is spending enough time within the target pace range to achieve the specific fitness gains. So don’t stress out over any individual repeats. A good strategy (both physically and mentally) is to start off at the lower end of the pace range, and then run progressively faster within your target zone. But then struggle to stay within the zone in later repeats. The seventh thinking trap is jumping to conclusions about what other people are thinking. So, what’s this got to do with marathon running, the loneliness of the long distance runner and all that? Well, we’re all social animals and this trap is particularly relevant if you’re a member of a running club. I’ve witnessed an unspoken rule, even on so-called steady or social runs that your fitness is on trial on club nights. Clients have admitted in coaching calls and consultations that they fear fellow club runners may disrespect them if they’re seen to be struggling. ‘race to the club hut syndrome’. Unless you purposefully substituted your club social run with an acceleration run at the last minute, this will disrupt your hard-easy training cycle. But with plummeting marathon rankings? They’re far more likely to be focussing on their own form! So are unlikely to be successful. The eighth thinking trap is taking the blame for situations that are beyond your control. Marathon runners need to be more flexible in judging their performances over a long campaign. Over the course of a marathon build-up, you will have to encounter and overcome adversity. And much of it is simply beyond your control. Get into the habit of using different performance metrics to suit the conditions you’re running in. Rate of Perceived Effort (RPE) is a better performance indicator than pace when conditions don’t suit fast running. The penultimate thinking trap is having a perfectionist attitude that’s impossible to maintain. Right down to the last stride without compromise. This encourages obsessive thinking patterns when a more flexible mindset is needed. These plans aren’t personalised to each runner’s individual needs, strengths and preferences. So without adjustment are likely to be be too tough, too easy or too monotonous! Create a training plan that provides an extremely useful framework, yet know that the reality will always be different! When you get into marathon training you quickly find out the map is not the territory. We’ve finally reached the last thinking trap, which is comparing yourself unfavourably to others. What this comes down to is comparing your performances and results obsessively with those of faster fellow runners. This is a serious trap as it is linked with low self-esteem. We noted earlier the fallacy of trying to excel in every marathon workout when conditions are outside your control. Judging yourself harshly in comparison with other runners relinquishes the control you have over your marathon prospects still further. Don’t fall into the trap of judging your current performances with that other self if the circumstances are markedly different. Your race performances as say a 55 year-old with a super-busy lifestyle, running four times a week, aren’t likely to compare favourably to that committed 28 year-old, running 60 miles a week! The most helpful comparisons you can make are in your own performances, as you track your fitness progression through your current marathon campaign. You now have the mental strategies to solve the 10 biggest marathon motivation issues! My hope is that you’ll refer back to them frequently, so you can stay pumped up throughout your campaign and get the success all your hard training deserves. I have condensed this blog post down into a one-page cheat sheet for you so that you can quickly and easily enjoy ‘mind over marathon’! 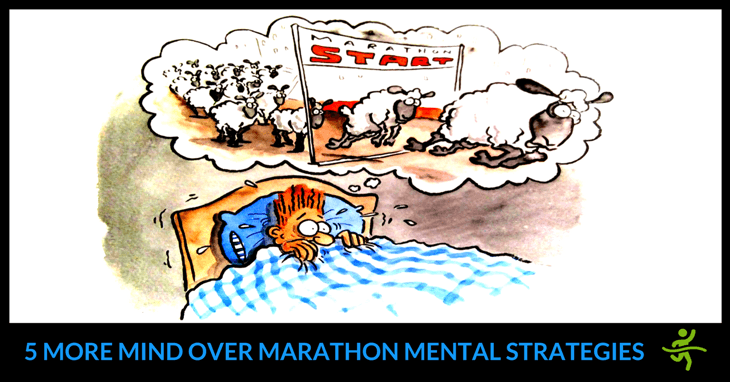 Please share your experiences of trying out these marathon mental strategies in the comments below.